Handl. Pl.-Kruidk. 12: 424 (1780). 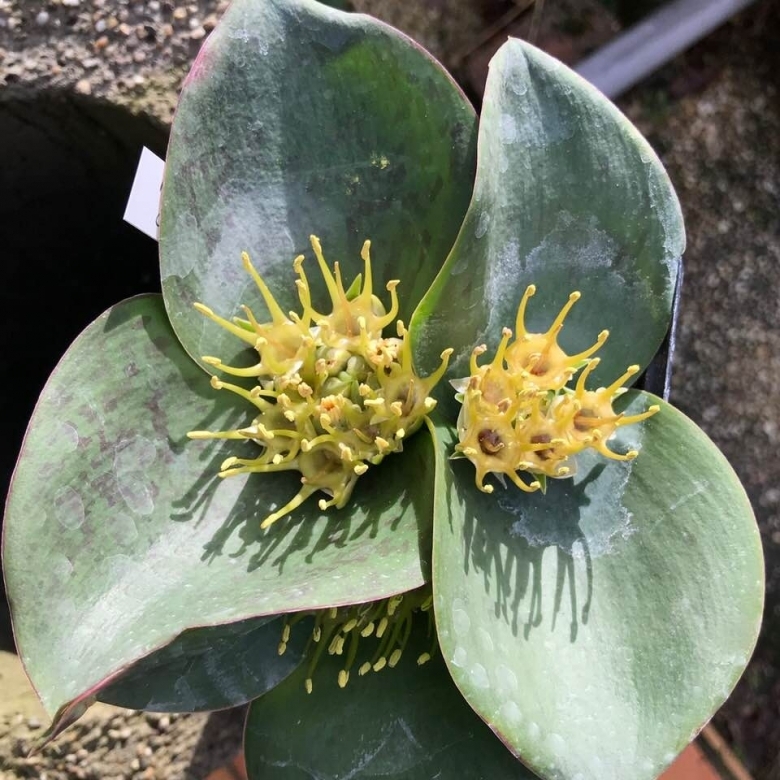 The dull-colored flowers of this low growing bulbous plant develop at ground level, have tiny petals, emit a yeasty aroma, and produce a thick, jellylike nectar. These features led researchers to suspect that desert rodents such as gerbils pollinate this plant. Habitat and ecology: Succulent Karoo. This species grows on sandy and clay flats with poor soil from Namaqualand through the Karoo into the Eastern Cape. 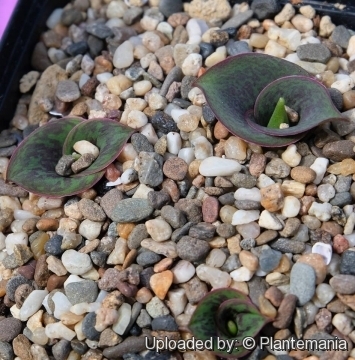 The ground-hugging leaves of Massonia depressa are very broad and trap night-time moisture, reducing water loss from the soil and their bulbs underground. Although the ground may be very dry, when a Massonia leaf is lifted, the area underneath is quite moist. The adaptive significance of this flat growth form may also include the avoidance of being eaten by grazing animals and temperature regulation of the leaves. 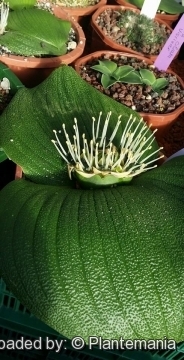 The greenish brown flowers of Massonia depressa develop at ground level, have tiny petals, emit a yeasty aroma, produce a thick, jellylike nectar. They are accessible to rodents such as gerbil who push their heads through the stamens to reach the nectar. 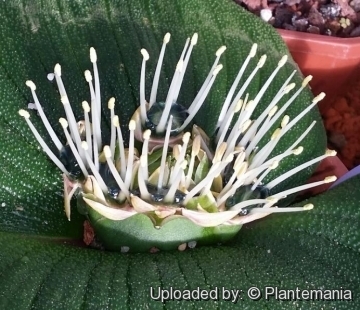 These features led the rodents to be the main pollinators for this plant. 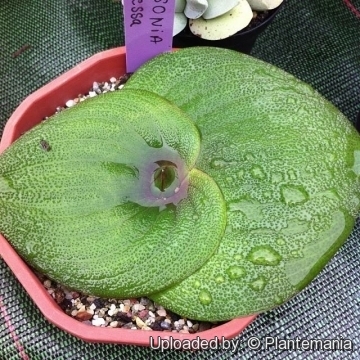 Description: Massonia depressa low-growing is a low growing succulent geophyte to 5 cm with 2 flat leaves that are sometimes blotched with green or maroon. The green, white, yellowish or pinkish, almost petal-less flowers of this plant, develop at ground-level clustered between the leaves. There is a great variation in the wild between individuals and populations and Massonia depressa - as treated by various authors - may include different taxa. A recent paper by Wolfgang Wetschnig et al. Stapelia 97 (2012): 210–221 proposes relocating some forms of this species to Massonia pustulata. Derivation of specific name: The epithet 'depressa' comes from Latin and means 'depressed'. Bulb: Globose bulbs to 4.5 cm in diameter. Tunics fleshy white. Leaves: 2, opposite, lying on the ground, oblong to orbicular, up to 26 cm long, 15 cm wide (frequently less), fleshy, green usually smooth and sometime with purple spots or with fine pustules. Inflorescence: Dense, capitate, to 30-flowered. The basal bract at the base are large, and surround the inflorescence. Flowers: Shortly pedicellate, with a yeasty odour, greenish, dull white or cream, occasionally even yellowish or pinkish, deeply cup-shaped, with a tube that is 3-17 mm long and4-8 mm in diameter at the mouth and contains copious sucrose-dominant jelly-nectar. The stamens have stiff filaments, 8–18 mm long, which are united to form a short tube at the base, the anthers are prominent more than 2 mm long, longer than on other species in the Cape. The style is 5–14 mm long. Flowers are pollinated at night, not by insects but by rodents. Blooming sesason: Massonia depressa flowers only once a year in winter (May - July). Fruit: The fruit is a three-winged capsule. Chromosome number: 2n = 26. Cultivation and Propagation: As with the other members of the genus, Massonia depressa requires the protection of an alpine house or bulb frame in regions subject to frosts. Well-drained soil and a bright, sunny aspect give the best results. They can be propagated by seed, flowering can be expected from two to three years from sowing. Traditional use: The genus Massonia is known to practitioners of traditional medicine who roast the bulb, grind it into a powder and rub it into incisions to treat certain illnesses.